In today’s second and final Memorial Cup review, we’ll look back to 2007. 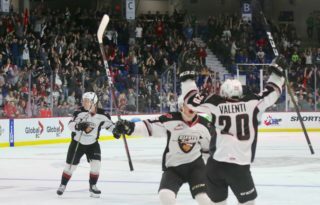 The Giants won the right to host the tournament but were determined to still enter the event as WHL Champions. 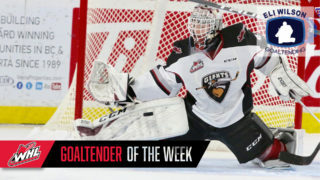 They rolled through Chilliwack, Seattle and Prince George in the WHL Playoffs, winning each series by a 4-1 margin before meeting up with the Medicine Hat Tigers in the WHL Finals. The two power-house teams battled all the way to double-overtime in Game 7 before the Tigers finally pulled out a victory. 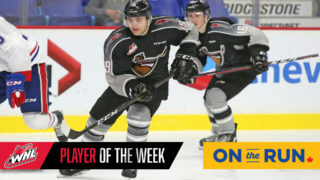 Clearly these two proud franchises were poised to represent the WHL well in the national championship tournament, and sure enough, they did just that. The tournament began on May 18 with a game between the Giants and the OHL Champion Plymouth Whalers, who featured future NHL’ers like James Neal (PIT), Tom Sestito (VAN), Jared Boll (CBJ) and Michal Neuvirth (WAS). The game was a see-saw battle that ended when the Giants’ Kenndal McArdle fired home a shot at 5:06 of overtime to send the 13,428 fans in attendance home happy. Vancouver’s Milan Lucic (BOS) scored two goals and was the game’s 1st star, while Neal also netted a pair and took home 2nd star honours. Spencer Machacek opened the scoring for the Giants. Two days later the Giants were cheered on by 13,734 fans at the Pacific Coliseum, as they took on the QMJHL Champion Lewiston MAINE-iacs. The US-based club was led by sniper David Perron (STL) and stalwart goaltender Jonathan Bernier (LAK), and was known to be extremely stingy defensively. A Perron first period marker held up until the third period, when Kenndal McArdle and Wacey Rabbit (two mid-season trade acquisitions for the Giants) scored to lead the Giants to a 2-1 victory. The win moved the Giants to 2-0 and set up a huge final round robin game against the Medicine Hat Tigers. On May 23, the final day of the round robin, those two familiar foes squared off for the first time since their epic WHL Finals series. The Tigers were led by Tyler Ennis (BUF), Derek Dorsett (NYR), Kris Russell (STL) and Darren Helm (DET), but their goalie Matt Keetley was the star of this night, posting a shut-out as Medicine Hat skated to a 1-0 victory. 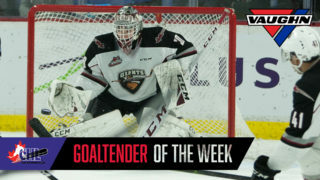 The win gave them an automatic berth into the Memorial Cup Final, while the Giants finished in second place and would face the winner of a Plymouth-Lewiston tie-breaker in the semi-final. Plymouth would skate to a 5-1 victory in that game, but proved to be no match for the Giants on ‘Semi-Final Friday’. There would be no repeat of the overtime that was needed when these teams met in the tournament opener, as the Giants bowled over the Whalers by an 8-1 score in front of 13,372 fans at the Pacific Coliseum. Wacey Rabbit, Cody Franson (TOR), J.D. Watt and Spencer Machacek had singles, while Michal Repik and James Wright (WPG) each added a pair. Most importantly, the wide margin of victory allowed coach Don Hay to use his entire bench – including the back-up goalie, Blaine Neufeld – in order to keep everyone rested and healthy going into the Final against the Medicine Hat Tigers. So the stage was now set, and on May 27, 2007 over 16,000 fans packed the Pacific Coliseum to watch their Vancouver Giants take on the Medicine Hat Tigers in the Memorial Cup Final. It was the ninth game between the Giants and Tigers that month, so both sides new exactly what to expect – a tight-checking, physical battle between two very talented and hard-working teams. The 1st period was scoreless but featured the most memorable moment of the tournament – something now known to Giants fans as “The Shift”. Vancouver’s Milan Lucic hopped over the boards roughly four minutes into the game and proceeded to hammer three different Tigers with punishing body-checks, including Jordan Bendfeld who then challenged Lucic to drop the gloves. But to no one’s surprise, Lucic won the fight and sent the crowd into a fervor, thus setting the tone for the rest of the game. Mario Bliznak opened the scoring for the Giants during a goal-mouth scramble in the 2nd period before Medicine Hat tied it up later in the frame with a marker from Darren Helm. Despite Vancouver badly out-shooting the Tigers, the score remained 1-1 until the 15:05 mark of the 3rd when Michal Repik tucked in a wrap-around to put the Giants ahead. They shut the door the rest of the way, and Spencer Machacek added an empty netter to secure a 3-1 victory and the first Memorial Cup Championship in team history. Wingers Milan Lucic and Michal Repik were named to the tourmament All-Star team along with defencemen Cody Franson and Brendan Mikkelson. Repik finishing tied with Lucic and Plymouth’s Tom Sestito in the tournament scoring race, but was awarded the Ed Chynoweth Trophy as Memorial Cup Leading Scorer based on a higher goal total. Lucic however received the Stafford Smythe Memorial Award as tournament MVP. It proved to be Milan’s final game in a Giants uniform, as he went on to earn a spot on the Boston Bruins’ roster that fall, en route to becoming one of the NHL’s most feared power forwards. And it should be noted that with the win, Don Hay earned his third Memorial Cup Championship as Head Coach – a CHL record.